A view of the crumbling structure of the Phul fort located in Bathinda district. 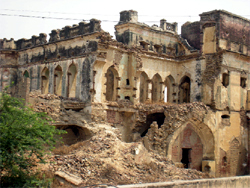 The historical fort of Phul, which was said to be the origin of Phulkian states (Patiala, Jind, Nabha), has lying in a state of utter neglect courtesy government apathy. Baba Phul had built the fort in 1712 but then, it was like a mud-fort. Later, emperors Hamir Singh, Bharpoor Singh and others showed interest and got it restructured. During British rule, a lot of money was spent on the ornamentation of the fort. Alas! None bothered to preserve it later; neither the kith and kin of the royals nor the state/centre authorities of the Independent India. The fort, which could bring the region on country's tourism map, is now crying for immediate attention with entire structure crumbling and turning into debris. A major portion of its structure has collapsed and the huge gates of the main entrance were closed about a couple of years back. However, finding the space as a source of income, the Market Committee, Phul, let it out. Now, some stalls (tea and vegetables) are being run outside the gate. A power transformer has also been installed there. Inside the fort, the old Baradari of the emperors is now being used as Block Development and Panchayat Office (BDPO). Further, officials of the Panchayat Samiti also have their office inside the historical building. Some modifications have been done to suit their needs. Most of the tombs have collapsed and the rest may fall anytime. An underground tunnel, which led to the queen's bathing pond located a few steps away, has also caved in. The high walls of the fort could not brave the weather for long and have been razed to ground. The artistic wooden doors of the rooms, which used to be embedded with jewels and colourful glasses, have been attacked by pests. Furthermore, due to the callous attitude of the authorities concerned, the sides of the fort have been encroached upon. The elderly people of Phul town, who had seen the period when there was lot of activity inside the fort, feel delighted on recounting the days when the Deputy Commissioner, Naib Sahib and Tehsildar had their offices in the fort. They had also witnessed the glorious movement of the last ruler of the fort, Maharaja Partap Singh, whom a huge cavalcade used to accompany on his visits to the fort. These old persons, however, feel sad about the fact that the system brought the downfall of the fort. "We have witnessed the fort when it used to shine from every corner. The pearls, diamonds, artistic wooden pieces, handicraft and mattresses were so beautiful and expensive. Later, some wicked people decamped with every precious thing and ruined it like anything," said 77-year-old Ram Sarup, who runs a provision store just opposite the fort. "Though the fort is located just a few miles from the ancestral village of former chief minister Captain Amarinder Singh, he did not bother to preserve it when he was in power," rued some elderly people.